The author suspects that human-kind’s love of hamburgers began when we were not humans at all, but a five-foot-tall pseudo-human called Australopithicus, who, quite by accident, discovered the wonder of cooked meat when either lightning or a spark from the friction of stone tools ignited dry grass and seared freshly killed bison. Two million years later on the Russian tundra, where the first recorded “burger history” reveals that Mongolian and Tartar warriors, who loved the taste of raw steaks, softened their filets by placing them under the saddles of their horses while riding into battle or on marauding parties. Later, when it was time to eat, the filet would be eaten raw, having been tenderized by the saddle and the back of the horse. Supposedly, this is the origin of the delicacy steak tartare, the raw first step to hamburger. The burger appears again a couple of hundred years on down the line on New York’s Ellis Island, where immigrants from Germany were entering the United States in the early 19th century with a recipe for “Hamburg Style Steak,” a chopped and broiled filet that was served raw in Hamburg. Later the patty would be joined with a bun, ushering in the modern era of the hand-held sandwich. Between those developments are several towns that claim to have invented the hamburger. 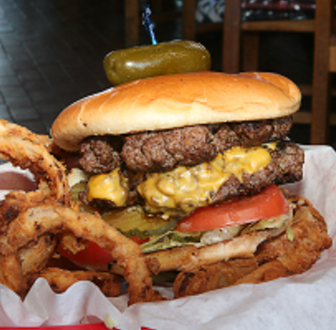 The residents of one of them, Seymour, Wis., argue that Charlie Nagreen created the hamburger at the age of 15 in 1885, when he delivered the world’s first hamburger from a concession stand at the Outgamie County Fair. The family of Frank Menches, whose descendants now live in Skron, Ohio, claim he invented the hamburger by substituting ground beef for pork in his famous sausages on one particular day when high heat and humidity forced butchers to stop slaughtering pigs. 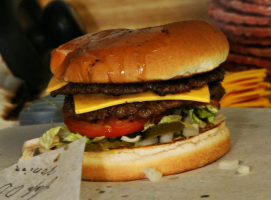 The widest-reported “first” appearance of the hamburger most commonly cited in the lore of foodservice was that the product appeared at the World’s Fair in St. Louis in 1904. Chuck Berry is rocking out on the Wurlitzer juke box, and from the moment you step into MG’s you know something good is going to happen. The place resembles a dream conjured up by a kid with a crew cut, Levis and yen for hot rods. The booths look like someone pulled a back seat out of a ’57 Chevy and then added the rolled red upholstery. Along the walls are automobile ads, vintage neon signs and miniature globes of the style that used to adorn gasoline pumps. Mike and Gina Adams (the M. and G. in MG’s) started this little bit of 1956 about 25 years ago and it has been Sherman’s top spot for burgers ever since. It’s packed on the weekends and does a rocking business seven days a week. So what’s the secret? “Secrets! We can’t tell you the secrets,” says Kelly Points, MG’s manager and chief burger cooker for the last 12 years, off and on. OK, but in reality the tricks of the trade are not that difficult to determine. Lined up and waiting for delivery to their owners at MG's. All the patties at MG’s weigh in at six ounces and have a fat to lean content that’s a little higher than you will find in most places. That’s why they are so juicy. “The meat is not processed or anything,” says Points, “so it takes a little longer to cook.” The grill is at 300 degrees, as confirmed when Points whips out his infrared thermometer that reads the temperature on the cooking surface. “They take about four to five minutes total,” he said, “and you don’t want to flip them too often. The more you flip the burger, the more the grease runs out and makes it dry.” Leaving the patty alone also allows a crust to form and prevents the meat from sticking. When the meat comes off the grill, it goes to the dressing counter where it nestles into a homemade bun. We’re talking made by Mom buns here. Actually Mrs. Adams, Mike’s mother, doesn’t run Mom’s Bakery next door any more, but her daughter-in-law, Laurie Adams, does, so it’s still in the family. The bakery also provides the restaurant with desserts and rolls. “On the weekend, we’ll prep 300 pounds of meat, so that’s about 700 or 800 burgers,” Mike Adams said. That’s a lot of hamburgers, and to go along with them, MG’s turns out a lot of fries and onion rings, too. The fries are fresh potatoes, pushed through a cutter, peel and all. The rings are cut and breaded by hand. To continue the automotive theme, the burgers at MG’s carry the names of automobiles— Chevy, Ford, Buick and the like—each one a bit different from the rest, sort of like custom cars. So, if you are waxing nostalgic, or if you just want a hamburger like the gang got at the malt shop, just break out the butch wax, put some new pennies in your loafers and head to MG’s at the corner of Woods and Fairview in Sherman. 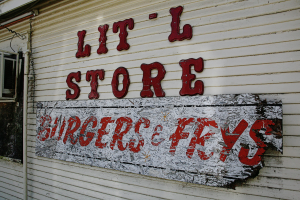 The Lit'l Store was once a cornerside grocery store, but it is now a great place to get a hamburger. When it’s really busy, (this is most days around lunch and always on Saturdays), Buddy Burroughs stands behind the grill at the Lit’l Store and deals hamburger patties like a Las Vegas dealer handling the paste-boards. The discs of meat are five inches across, weigh a little over three ounces and are frozen, so they clatter as he flips them down on the grill. 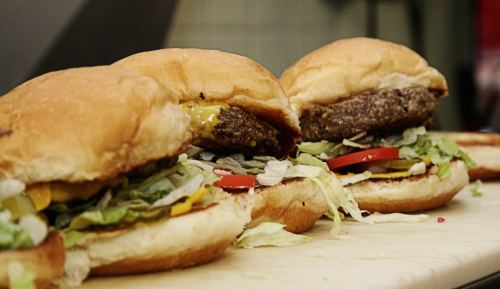 The buns are on the left side of the cooking surface where the residual heat will toast them while the patties are cooking. Much of the time you can’t see the grill; it’s covered with meat and buns. When you are cooking 300 to 400 hamburgers every day, it stays that way. Hungry workers from nearby offices and manufacturing plants call in orders ahead of time and then cart out bags and boxes of burgers to take back to their friends. The building at Rusk and Center was a boarded up convenience store when Burroughs and his wife, Delene, started the business. Judging from the architecture, if architecture isn’t too grand a term for the little white frame building, it was gas station and corner grocery once. It holds to its grocery store roots with a few canned goods and other odds and ends, but folks don’t really come there to shop, they come here to eat hamburgers, cheeseburgers, BLTs, steak sandwiches, Frito pies, and many of the other staples of the short order lunch room that are on the menu. People queue up in front of the counter and read the funny signs on the ice machine behind the cash register while they wait to place their orders. Another knot of folks stand off to the side waiting to pick up orders. While Buddy Burroughs mans the grill most days, Delene either works the counter or works in the back, in the kitchen. It’s a narrow room behind the grill and counter, and there is no wasted space. There is no wasted effort either. With a couple of women helping her on a Saturday afternoon, Delene Burroughs lays out a couple of dozen pieces of tissue wrapping paper, puts a bun heel on each one and dresses the bread with what ever is called for on each of the dozen tickets hung from a wire overhead with clothes pins. Tomatoes, lettuce, pickles and onion are the usual fare, with mayonnaise or bright yellow ballpark mustard. There is bacon if you want it, and one of the specialties is a barbecue burger. It’s a hamburger with a scoop of barbecue under the crown. Messy but tasty. Back on the grill, Buddy has topped some of the patties with squares of cheese before he puts the warm bun crown on top. Then he slides his spatula under two at a time and reaches through the window in the wall to plop them on the buns. The corners of the tissue paper are folded over and a tooth pick jabbed in to hold everything in place and your burger is ready. There is a steady stream of people carrying the food in brown paper bags and sometimes boxes out the front door, but for the best treat, you’ve got to eat the hamburger while they are still hot off the grill. So the experienced burger master grabs a Coke from the cooler, takes a seat at one of the tables around the corner, gives a nod to the picture of John Wayne on the wall, and digs it. Lit’l Store burgers are not for sissies. They are hot, a shade greasy and heavenly. Real food. No secret sauce and no fancy names. I’ll take mine with cheese, please. But hold the onions. T-Bones Bar and Grill is in the Katy Depot, but that’s not the only connection to the past for the popular restaurant. Owner Mike Walker is the grandson of Charlie Watson, founder of Watson Burgers, so you might say that Mike has burgers in his blood. “If I don’t have the burgers right by now, I’d better just give it up,” he said. Walker’s mom works in the kitchen during the day, so when he talks about home cooking, he’s talking about his home. The patty goes down on a flat grill at about 300 degrees and cooks for five minutes or so. No excess flipping if you please. The meat has to be left alone so a crust will form, and it won’t stick. Walker’s favorite is a cheese burger. He said that a slice of good old American cheese sort of sticks the whole thing together. When he was growing up, the family ate a lot of hamburgers when they were on vacation; they were checking out the competition, and liked to stop at the little places in the small towns. These days the competition comes from the franchise restaurants and the fast food places. The local restaurants and small cafés are going fast, but thanks to places such as MG’s, the Lit’l Store, and T-Bones the folks in this part of the world can still find the real thing when the craving hits them. This article appeared in the Winter 2006 issue of Texoma Living!. The rattle of the alarm echoed across the area, signaling a chlorine leak from a storage tank at the large industrial plant in Grayson County. As the men encased in the special gear that gives them the look of moon-walking astronauts went about the very serious job of dealing with the problem, a company representative standing a safe distance from the scene remarked. Slaid Cleaves is often referred to as a “songwriter’s songwriter,” which is code for the fact that his voice isn’t exactly melodious. One. It’s the number of stars in the Texas flag. It’s the number of U.S. Presidents who have conducted the OU-Texas pre-game coin toss. And it’s the number of shirts lost by Texas Laundry in the last six months. For a business that handles upwards of 1,000 garments per day, the statistic is unbelievable.